Making money from a blog has never been easier. Regardless of your focus, you can monetize each and every website or blog you start. If you focus on interesting subject matter, building an engaged community, and honest, passionate writing, you’ll build the trust and following you need. And the more readers you have, the easier it will be to turn that traffic into income. I started blogging a year and a half ago at JustOneWayTicket.com. After six months, I started making money from my website. After one year, I was making enough money from blogging to give up all my freelance jobs and travel the world. 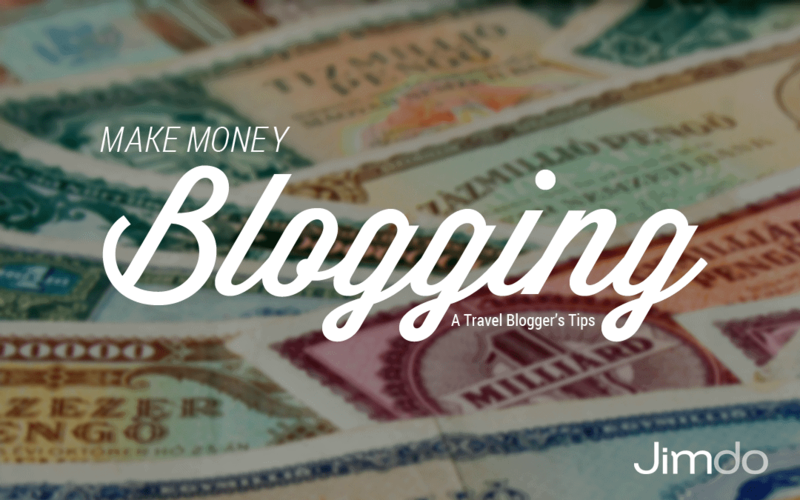 I’ve compiled a list of eight ways to make money blogging. Just remember to use advertisements and other revenue streams sparingly at first so that you can find the right balance and keep your readers as your top priority. Affiliate marketing is a great way to make extra money and create a passive income stream. But what exactly is affiliate marketing? It’s a performance-based marketing strategy, where a business rewards an affiliate—like your website—for each visitor that you bring them. In other words, you earn money for referring your readers to other websites. Before you start adding a ton of affiliate links to your blog, ask yourself what kinds of products might interest your audience. Think about your favorite products and then write about them. But be sure to only suggest and refer products that you truly love. You can also create a resource page on your website, where you list all the products you use. Here’s my page with all the stuff I love. What affiliate programs are best? Amazon.com Associates: The web’s most popular and successful affiliate program is Amazon.com Associates. It’s a great place to start because Amazon sells just about everything. Sign up for their partner program, search products that you like or use, and mention them on your blog. In my case, I often make videos for my readers, so I recommend the cameras that I use with a short description as to why I love them. E-Junkie: If you’re into digital products like eBooks, you should sign up for E-Junkie. The commissions on eBooks are excellent on E-Junkie, often around 50%. Awin and CJ Affiliate by Conversant: Affiliate networks like Affiliate Window and CJ Affiliate by Conversant are also great choices because they offer a wide range of advertisers and agencies. The most popular pay-per-click (PPC) advertiser, also known as cost-per-click (CPC), is Google Adsense. It’s simple: you sign up for an account and add advertising banners to your blog. You are limited to three ads on each web page. Every time someone clicks on an ad on your blog, you get paid. The amount you make for each click depends on several things, such as the value of the keyword associated with the ad and the location of the person who clicked on it. Generally speaking, you’ll make somewhere between a few cents and a few dollars per click. Make sure your articles use the right keywords because Google Adsense will serve ads based on your content. The more relevant the ads are, the more likely your readers will click on it. Once you set up an account, Adsense will let you select where the ads appear on your site. The top of your sidebar is one of the best positions to place a banner ad. Ads placed at the top of your website usually get more clicks than ads at the bottom. Another great place for ads is right below a blog post headline. I’ve placed Google Adsense ads at the top of my sidebar. Pay-per-view (PPV) advertising, also known as cost-per-mille advertising (CPM), are similar to CPC ads. The difference is that you get paid per 1,000 views, not per click. On average, you can earn about $1-2 per 1,000 views. So if your website has 100,000 pageviews per month, you would earn between $100-200 per month. I personally use and recommend Yielselect. But another reliable CPM network is Tribal Fusion. In my personal experience, I’ve earned more from Google Adsense CPC ads. But if you’re just getting started, I suggest you implement both on your blog and find out what works best. The most lucrative form of advertising is to offer banner space and text links directly to advertisers. You can place them in your sidebar, your footer, or directly within blog posts. I’ve found that placing links in the footer of my homepage works best for me, under a section called “Resources & Partners.” Some of them are bought by advertisers; others are affiliate links that I’ve added myself. But as with all advertising, I suggest you test various locations to see what works best. This is my homepage footer with direct advertising links. You can also show that you sell banner space by adding a box on your sidebar that says “Advertise Here.” Or consider adding an “Advertise” section to your top navigation. If advertisers aren’t knocking on your door regularly, you can sign up for an ad network like BuySellAds. You’ll be able to set your rates and wait for the offers to roll in. Another smart tactic is to visit other blogs in your industry and find out who advertises on their blogs. If you see one that might be a good fit, search for their contact information and send them an offer. As your website attracts more readers, advertisers will also approach you about sponsored posts. These advertisers generally send you a completed post, including a link to a company website, asking you to publish it on your blog. You get paid for your reach; the more popular your blog and the higher your PageRank is, the more money you’ll be offered for a sponsored post. Not all bloggers agree on sponsored posts. Some frown upon the practice, but I have found sponsored content to be one of my biggest income streams. If you do decide to go this route, you should always place a clear disclaimer on the sponsored post, so your readers understand that it is paid content. Any links you include in these posts should also use the ‘nofollow’ attribute, which is standard practice when linking to paid content. Alternatively, you can offer to write an article for the advertiser to make it a better fit for your audience—but it’s best practice to disclose when an advertiser is paying you to write something. If it fits your niche, you can write paid reviews about products that you think are of interest to your readers. Again, it’s important that you always disclose such posts to your readers. Even more important is to write honest reviews; you never want to comprise the trust of your readers for a few extra dollars. Sponsored Reviews is a popular site to find advertisers, who are willing to pay for a product review post. Once you’ve built a readership that values what you’re saying, your blog can be a platform to launch products or services. Write an eBook: Launching your own eBook can be one of the most lucrative ways to monetize your blog. “How to” guides are especially popular. You can sell eBooks on E-Junkie, Amazon, the Apple Store, or on your website. It’s a great method that doesn’t involve any investment besides your own time. Once written, you can update it once a year and continue to make money for years to come. As I’ve said before, make sure to write quality content. Consulting and coaching: If you become an expert in your blog’s field of focus, you can start offering consulting services. Think about the things that you know inside and out; advice that friends and family always ask you for. You can offer one-on-one coaching for an hourly rate to help people reach their goals.It’s understandably difficult to sell such services when you first start a blog. You need to earn the trust of a dedicated group of readers. If you’re interested in pursuing this type of avenue, consider adding a “Hire Me” section to your blog, where you can offer your services. If there is one piece of advice that I always give bloggers who are starting out, it’s this: be active on social media from day one. There are a lot of social media networks nowadays, but today the most important ones are Facebook, Twitter, Google+, Pinterest, and Instagram. Choose at least two of them and spend a little time each day building them out. It pays to build followers and fans, because the more people that follow you, the more influential you become. You make money on Facebook and Twitter? How is that possible? I get these questions all the time. There are numerous companies that pay me to tweet or share a post on my Facebook Fan Page, simply because I have thousands of followers that value what I say. How do you get more followers and fans? With Twitter, it’s actually quite simple. Start by following people in your niche. In most cases, around 20-40% of them will follow you back. Next, follow the followers of other top bloggers in your industry. I’d also make sure that your Twitter profile pictures look interesting to the average visitor. While following a lot of people can be time-consuming, there are some great tools and applications that can help you build followers in a short period of time. My favorite app is ManageFlitter. It’s a tool that will help you to follow hundreds of people and unfollow those who do not follow you back. Where can I find advertisers that will pay for tweets or shares? The short version: if your social media profiles are popular, the advertisers will find you. But if nobody contacts you, check out Izea. It’s a great website that connects influencers with companies that are looking for people to tweet about their products. You can earn anywhere from $5 to $100 for a single tweet. I started my blog as a hobby, but today it’s providing enough income so that I can travel the world and write about the things I love (you can do it too, check for more information here). Over time I’ve learned how to incorporate ads and sponsored content, while still keeping my blog personal, honest, and useful to my audience. It may take time to find the right balance, but it’s definitely worth it. If you’re trying to monetize your blog, don’t give up too early. It may take time. As long as you love what you do and write high-quality content, additional income will follow. If you have any other ideas about how to make money blogging, I’d love to hear them. Feel free to leave your thoughts in the comment section below. This article has really changed my mentality. Thanks. Thank you for reading, Kufre! but the question is: how did you find readers of your blog? I interviewed Sabrina for the Travel Like a Boss Podcast after hearing that she was making $3,000 a month from her blog, and quickly used her tips on my own blog. I’m happy to say that my blog has been making A LOT more money now than before I spoke to her. Her tips work! Follow her advice. iTunes have an affiliate program too, very interesting for music blogs. Using a combination of Amazon and iTunes affiliate programs, linking to albums, helps bands and artists to sell their work. And at the same time, you get a little help for your work as a blogger. Hi Sabrina! Thank you so much for sharing this. I started my travelling blog just 1 month ago. I hope that one day, I will be able to earn some money on my blog. Your advices helps a lot, and I will follow them to reach this goal. May I know the name of the program? Thanks Sabrina, this is really helpful! I apparently have loads I can learn from you! :-) Our time in Chiang Mai is to focus on this very thing. Bringing in more money. Thanks for this list. First off, congrats on becoming a full time, pro travel blogger. Secondly, congrats on a super helpful post. I retired to a life of island hopping through smart blogging a few years back. I’d say that creating massive value and engaging in serious blogger outreach will help you form bonds as much as any other strategy. Once you create massive value through your posts, videos, and podcasts, and you connect with many leaders in your niche, you’re beyond golden. At that point, any monetizing channel you choose that’s in alignment with your core message/brand/blogging niche will prosper you. Amen on eBooks. I wrote Blogging from Paradise the eBook, about 2 months ago, and since then it’s received an endorsement from a New York Times Best Selling Author, as well as a million dollar earning blogger. Blogger outreach and having a neat story to tell helped me create this income stream, but getting that eBook published was the first step to set it all up. Thanks so much Sabrina, I’ll tweet this in a bit. Hi firstly i love your comment. Coming to my question will you be my mentor? Great article (like all of yours) told me everything i was looking for on one page! !Thank you so much. Keep travelling! Excellent pointers here…I will try the same and see how it goes.. Thanks Carol – all your travels look amazing! Best of luck! Some really great tips on how to improve your blog. A year and a half is quite small in comparison to a lot of blogs that have been running for multiple years. I think having a niche helps, but traveling globally requires no niches. There are a few other ways to monetize I think, but people need to think outside of the box. Personally I’m not a fan of the whole eBook market, but I guess if its what you believe your readers will use, then why not? Thanks Jamie. It’s great to hear feedback from other travel bloggers as well. Hey thanks for the advice. I have only just started and find promoting on Facebook and Instagram takes a lot of time but the results I have had so far are definitely worth it. Happy travels ! Special thanks for the very informative, practical and interesting inputs ! What I wanted to know are all here ! …. you will be blessed more ! It’s the first time I see a blogger who actually SHARES the secrets of blogging and not only encourages to blog. THANK YOU very much for sharing. I’m planning to start a traveling blog that focuses on Germany (for now), I wish that in one year from the moment that my blog is on air to thank you again, but not here, in my blog with many followers, including links to this article and your blog. Great article Sabrina not only to grow your blog but easy ways to earn money from people just visiting. I’m off to sign up to Twitter! As always, as always Sabrina.Your story never failed to push me harder to do better in future. This is such a great article and one I needed right now! I am trying to do what you do and am having the hardest time. I’m hoping with awesome tips like you give, and networking with others, it will help guide me in the right direction. Thanks so much! Such a good read Sabrina! We’ll definitely remember these things to make the most out of my new site! Thanks for sharing your experiences! Thanks for the advice Sabrina.As i am new i found this really useful. It really takes a wonderful author to produce such great ideas. Thank you for sharing. A very useful one indeed. Thanks Sabrina! A very informative post, you’ve brought clarity to many of the things I’ve been wondering about since starting my blog. A lot of hard work goes into what you’ve done and I for one appreciate your willingness to share. Have a wonderful day. Thanks again for the great tips. Wow! Absolutely my favourite ‘how to’ blogging post. All your advice is so simple, concise and clear they I feel I can actually go away and action it. Thankyou for breaking down some serious barriers! Great advice. A few really helpful tips there on twitter. Basically I must do better and work a bit harder at getting active on social media! I been hearing a lot about creating fanpages on facebook to make money online very insightful. I love it really.Thanks for the free advice .Am acting on it ASAP.Keep travelling! June 6, 2018 Johnson K.
July 13, 2015 Johnson K.
Saw this post just now, great post on sharing all the details in blogging, thank you! Good luck in your venture!